This delicious Chinese recipe is so easy to make and the flavour is wonderful. 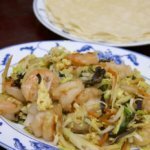 The shrimp, vegetables, aromatics and hoisin sauce are served in warmed tortillas, and the best thing is you can prepare this one-pot meal so quickly and easily, making it perfect for dinner when everyone gets home hungry and ready for something yummy. Stack the tortillas and wrap them in foil, then heat in the oven until warmed through. Heat a wok until very hot then add a tablespoon of the oil. Stir-fry the shrimp for 2 minutes or until cooked through. Remove them to a platter. Add 2 tablespoons more oil to the wok. Beat the eggs with some salt and black pepper, then add those to the wok. Cook for 2 minutes or until you get large, soft curds. Add the eggs to the shrimp on the platter. Add 2 tablespoons of oil to the wok and add the mushrooms, ginger and garlic. Stir-fry over a high heat for 5 minutes or until golden. Now you can add the last 1 tablespoon of oil to the wok. Add the spring onions and coleslaw mix and some more salt and black pepper. Stir-fry 4 minutes or until the cabbage is wilted but not too soft. Put the egg and shrimp back in the wok and add the hoisin sauce. 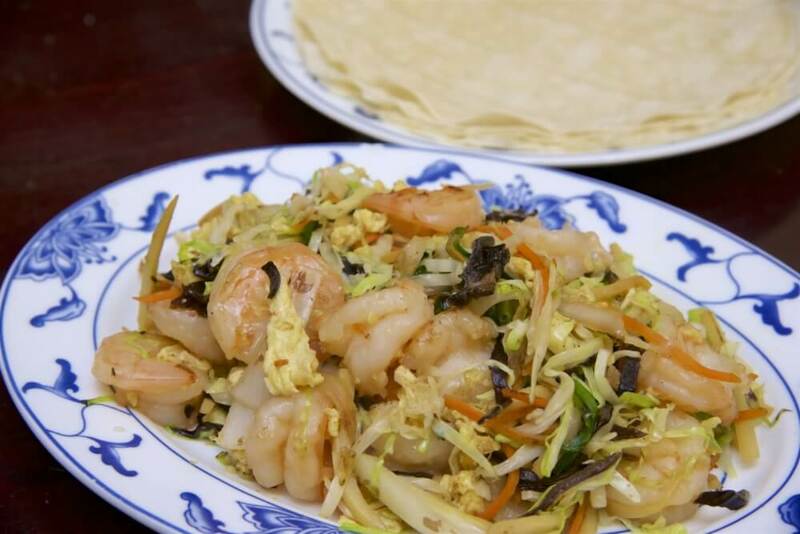 Serve the shrimp mixture with the warmed tortillas, extra hoisin sauce and some coriander leaves.